We help ensure emergency responders and healthcare professionals have the right information to care for you. Standardized medical terminology on your ID is preferred by emergency responders and healthcare professionals. A medical ID alone can only say so much. MedicAlert IDs give emergency responders access to your detailed medical profile. A live agent answers calls in over 140 languages. Only MedicAlert notifies your loved ones of your situation and location in an emergency. MedicAlert is the most trusted medical ID service among emergency responders. We offer over 150 comfortable, durable and stylish options. Get protected for only $1 a week. Your information is reviewed by a medically-trained specialist, then your ID is engraved and shipped to you. Emergency responders look for your MedicAlert ID. Emergency responders identify your medical or cognitive condition, and any medications or devices. If required, they call the MedicAlert 24/7 Hotline for your detailed medical profile. Access to your medical information enables emergency responders to treat you efficiently. You are treated quickly and accurately based on your medical information. 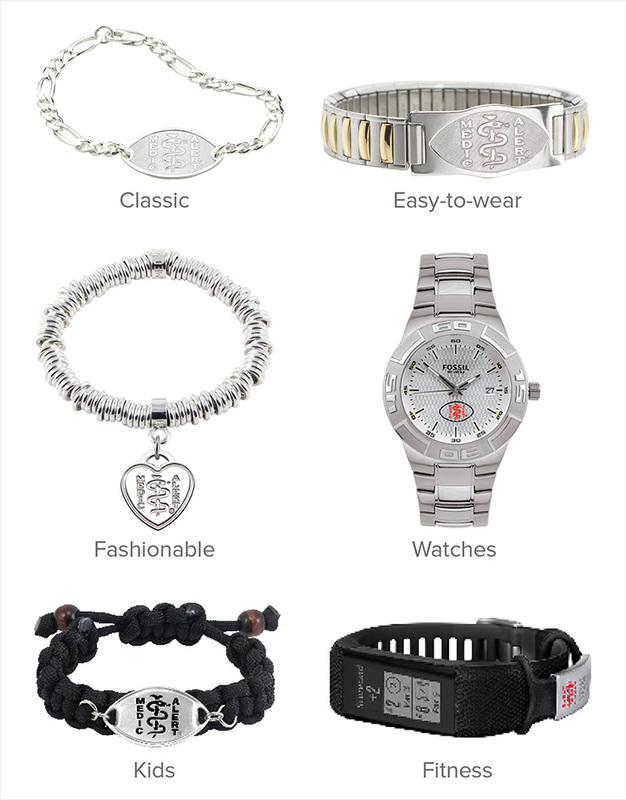 Choose from over 150 styles to suit your lifestyle. Our medical IDs are comfortable, durable, and stylish.